I know, I never saw/heard/thought of it before, but low and behold, it exists! 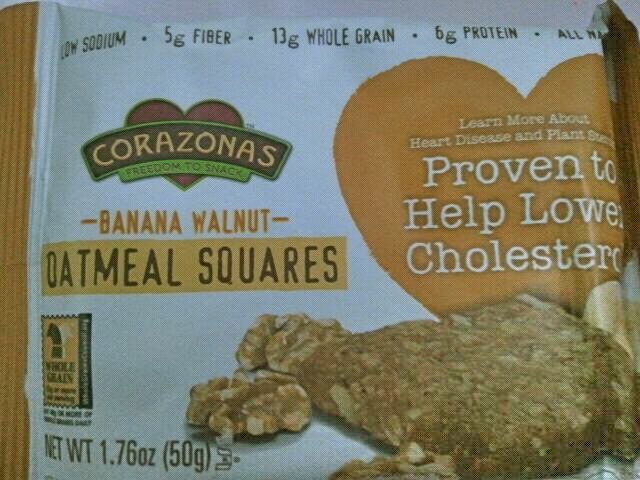 I got a free sample to try from the company, and with the combination of 1. Being hungry 2. 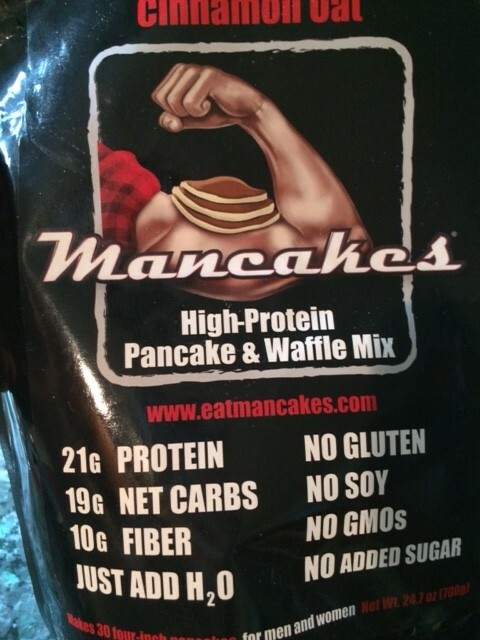 Not wanting to eat junk food and 3. on a high protein diet, I saw this as the perfect opportunity to try this snack. 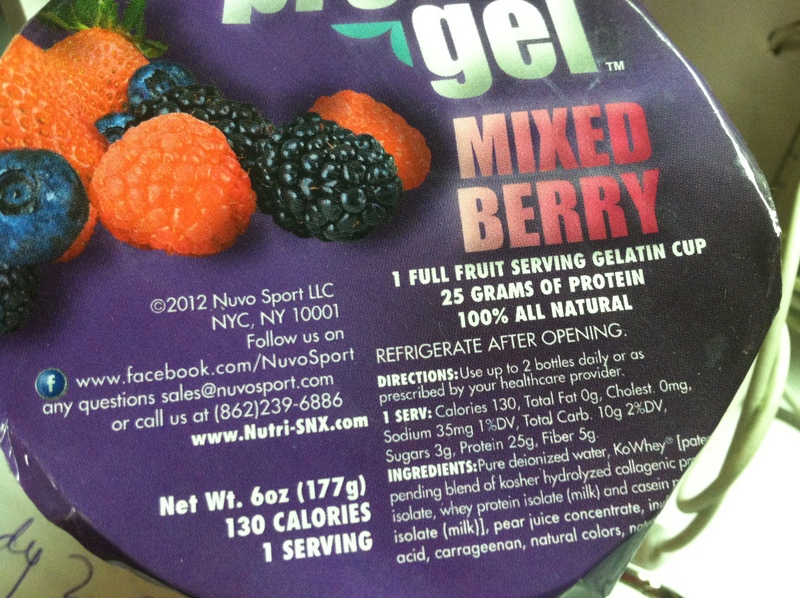 I opened up my Pro-Gel, which was packed with protein, low in calories, and even had some fiber. Here’s how it looked. I scooped some out, and noticed it’s thickness. Now, I’ve had my fair share of Jell-O in the past, so I’m familiar with the consistency. 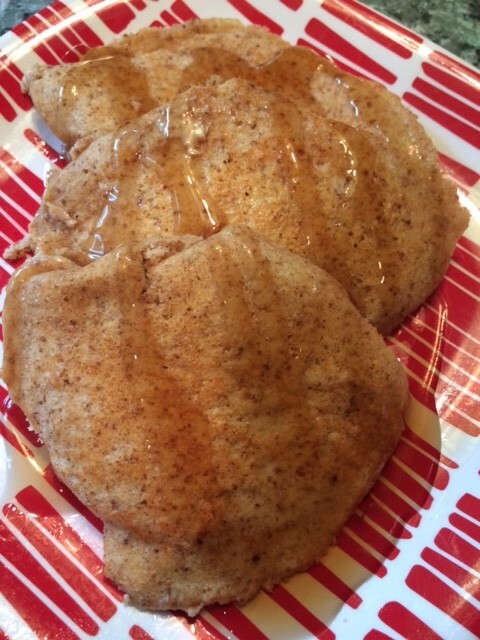 This was pretty much the same just…thicker and a bit stickier. The flavor? It was ok. It reminded me of a strawberry Kiwi flavored gelatin. And a sugar-free one at that. Being a diabetic, I’m used to sugar free products, and I can really tell when a product has been sweetened by sugar or not. This tasted like it was sweetened with sugar, as it was “sweet” but not really sugar sweet. However, the tartness overpowered any potential sweetness it could have. And while I appreciate it that this doesn’t taste like it’s fortified with any protein, I don’t think I’d be able to eat it again. It wasn’t really that good, and too tart. Perhaps if it was a cherry flavor I would have liked it more. But whatever flavor it supposedly tasted like other than “tart”, I was not a fan of. Overall, 2 stars. It wasn’t horrible, I just wouldn’t buy it in the future. Love the high protein for such a small cup, but I’ll stick to my eggs, protein bars, milk and lots and lots of peanut butter for my protein for now! Peanut Butter. Not a day goes by that I don’t consume either A. some type/variety of peanut butter or B. apples. (what a coincidence that they go perfectly together!) I’m always up for new varieties to try, like the Naturally More Peanut Butter. 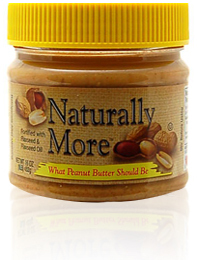 I had tried the Organic Naturally More Peanut Butter, and really enjoyed it. I was hoping I’d like the original as well! 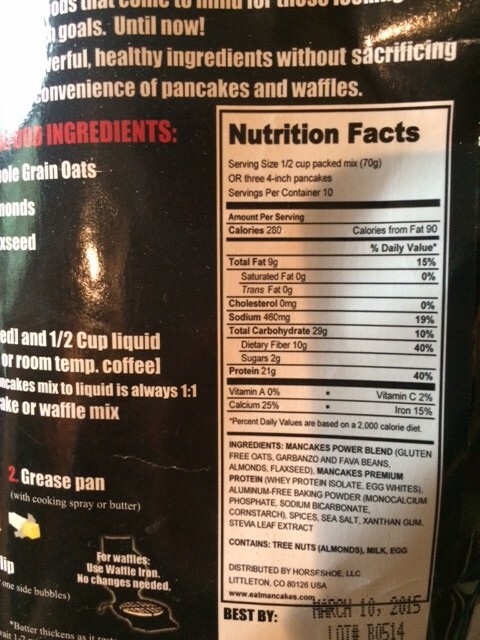 Some interesting things about this peanut butter, it has 4 grams of fiber and 10 grams of protein for a 2 Tbsp serving, with only 11 grams of fat. According to the jar, this peanut butter is “fortified with flax seed, flax oil and other nutrients” as well as containing “omega-3 and omega-6 essential fatty acids. It’s What Peanut Butter Should Be!” Sounds good to me! 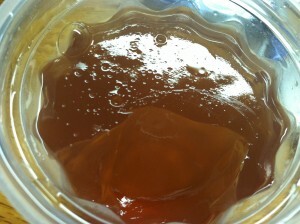 So I opened up the jar and noticed a thick layer of oil and floating flax seeds on top. Not the prettiest, but nothing a little stirring couldn’t fix. I stirred it up and placed it in the fridge to set for a little while. Then I opened it up later on and noticed a nice creamy peanut butter, with the oil seperation very minimal if any since refrigeration. I took some off a spoon and tasted it. I would say this peanut butter has some pros and cons. 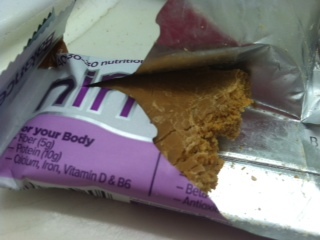 I liked that it wasn’t too salty or too sweet, and had a pretty good peanut butter flavor. 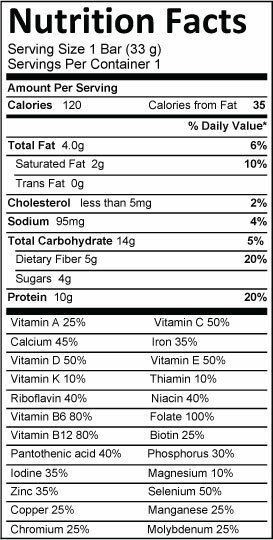 I liked that it was higher in fiber and protein than traditional peanut butter, and had omega-3 and omega-6 fatty acids. 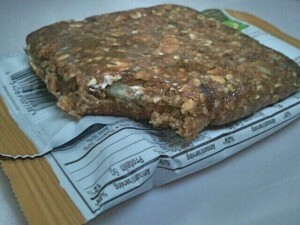 I also kind of liked the little bit of crunch that the flaxseeds provided, almost like a crunchy peanut butter. I didn’t really like the flaxseed flavor that was quite noticeable. I’m the type of person who likes to eat peanut butter straight from the jar, and while this peanut butter is good, I don’t think I’ll be eating it off of a spoon. However, I did spread it on a chocolate muffin, and it was TASTY! I couldn’t really detect the flax seed flavor at all. 2 tbsp. 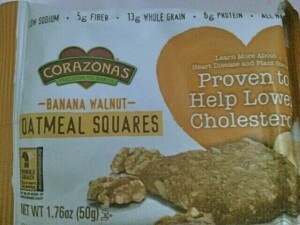 is 169 calories, 11 grams of fat, 8 grams of carbohydrates, 4 grams of fiber, 2 grams of sugar and 10 grams of protein. What I like about Healthy Picks Granny Smith Applesauce is that they are a bit different than other applesauces that I have tried. 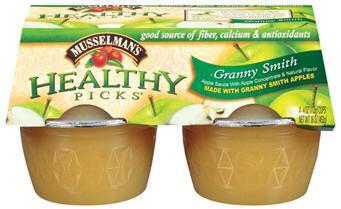 Aside from being all natural, this applesauce also has THREE grams of fiber and 10% of daily calcium needs per 4oz. cup! Fiber, calcium, and good taste? I’m loving that! So, last night I opened up one of these cups to enjoy with my dinner. It was a normal colored applesauce, perhaps just a tad more green/yellow than what I’m used to. I was a bit scared or hesistant at first- even though apples are my favorite fruit, I’m really not a fan of Granny Smith apples. In fact, I really only eat them in two conditions. 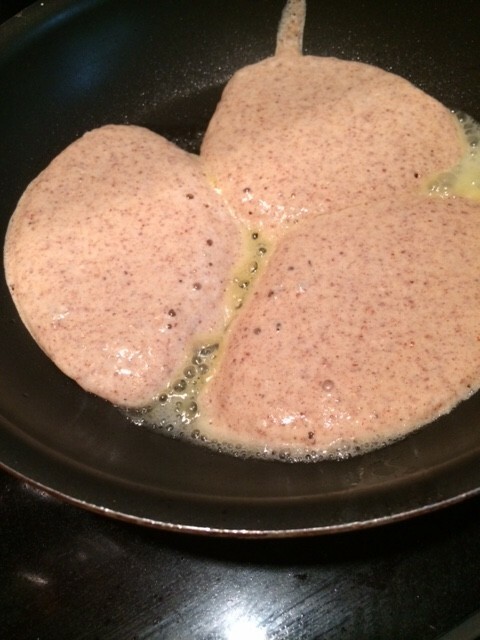 One- with peanut butter or Two– with a bland/unsweetened cereal and milk for breakfast. I usually find them too tart and even too crunchy for my preferences. However, I tried this applesauce and really enjoyed it! I could certainly taste the granny smith aspect of it, but it really wasn’t tart at all! There was a good amount of sweetness as well, which I certainly enjoyed. The texture was smooth, yet still had a little bit of consistency which I liked. It had the consistency of a fruit sauce, not a super smooth puree. Overall, 4 1/2 stars! I would most likely buy this if I saw it in stores. 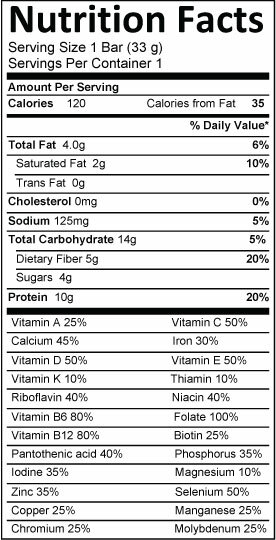 I really love the extra fiber and calcium, and it’s great taste. It’s mild enough to eat with a meal, but sweet enough to also eat on it’s own. Delicious! 1 4oz. cup is 70 calories, 0 grams of fat, 17 grams of carbohydrates, 3 grams of fiber, 10 grams of sugar and 0 grams of protein. 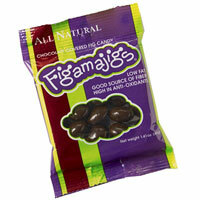 Figamajigs are a different way to enjoy candy, according to them, it’s “A Healthy and Delicious Way to Enjoy Chocolate”. What could be so healthy about chocolate? Well, these candies are all natural, provide fiber & antioxidants, and are relatively low in fat. They make both bite sized candies and fig bars covered with delicious chocolate. The company sent me some of their goodies to try, and I picked the Dark Chocolate Covered Fig Candy to do a review on. Now, I’m TOTALLY a Raisinette girl. When we go to the movies, my friends get the popcorn and the nachos, and I get the Raisinette’s candy. It’s my way of eating a “healthy treat” while still indulging. Hey, raisins are FRUIT! So I was super excited to see these. First of all, each bag (40grams) provides a hefty amount of tasty chocolate covered fig pieces. Do NOT be turned off by the word “fig”. I know you’re probably thinking fig= prunes= grandma candy. Uh, NO. These are actually quite good! Each piece is actually pretty big, if you ever ate the Peanut Butter flavor of the M&M’s, they are about that size. If not, they have the same size of I’d say a dime, but VERY thick! There is a decent amount of smooth and rich dark chocolate coating every fig piece. You can’t even really taste the fig- it tastes just like raisins to me! The fig piece was a bit chewier and grittier than raisins, but still quite good. They were sweet, but not overpowering, and I actually really enjoyed these. 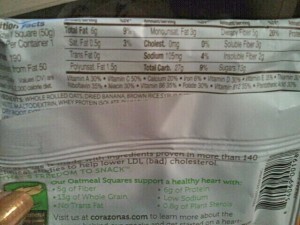 Each bag that provides about 20 or so pieces is only 150 calories and 4 grams of fat. How’s THAT for kicking a chocolate craving! Overall, as far as candy goes, 4 1/2 stars for sure. Antioxidants- check. Fruit- check. Fiber- check. CHOCOLATE-check! Can we say, perfect snack? 🙂 Yes, there is added refined sugar, but I mean it is candy, and FAR better than some other candies you can buy! I can only imagine the possibilities with these- I’m thinking mixed in with Chobani or greek yogurt, or with a trail mix, or even slightly warmed with buttery popcorn (all natural, of course!) . Yum!! 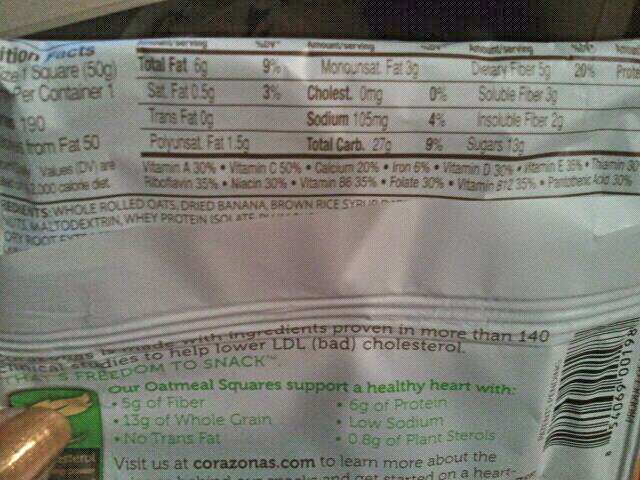 1 bag (40 grams) is 150 calories, 4 grams of fat (2 saturated), 29 carbohydrates, 3 grams of fat, and 2 grams of protein. They even provide 6% of your daily needs of calcium and 15% of your daily needs of Iron. Figs, Dark Chocolate (sugar, chocolate liquor processed with potassium carbonate, cocoa butter, butter oil), Soy Lecithin, Pure Vanilla, Cocoa, Sugar, Rice Flour, Invert Sugar, Natural Flavor, Cream of Tartar, Canola Oil, Salt. But, whooooo likes all the calories sugar contains and how ADDICTIVE it is, making us crave MORE? Luckily for you, I found a pretty good answer. Aside from Stevia all natural sweetener, I found a product that is sweet, low in calories, and actually has some health benefits. 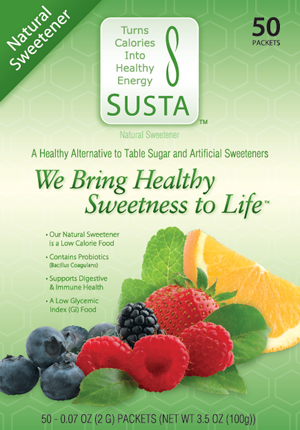 NXT Nutritionals manufactures a sweetener called Susta, and claims it is “A Healthy Alternative to Table Sugar and Artificial Sweeteners”. This particular sweetener combines soluble fiber (prebiotics) and probiotics(like the ones found in yogurt), has added essential nutrients and vitamins, is all natural, and has a low Glycemic Index (so no harsh blood sugar spikes!). 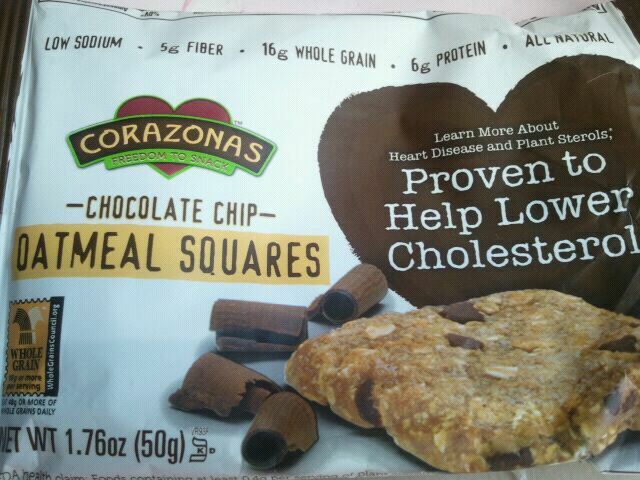 Each packet is also only 5 calories per serving. Each packet provides an ample amount of a fine, white powder, not really granulated per se, but more refined. 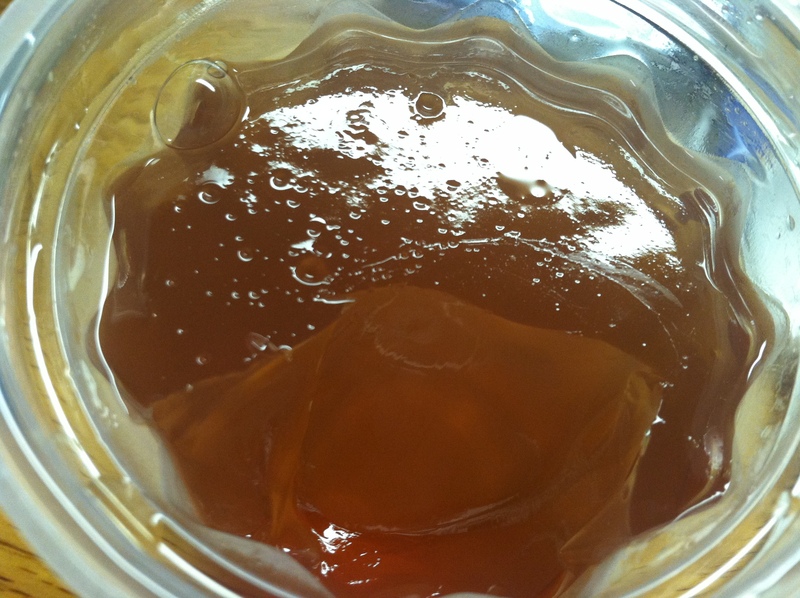 It has a nice, sweet flavor, very similar to sucrose or table sugar. It also doesn’t have a nasty aftertaste like Splenda, Aspartame or even Stevia can have some times (sorry, Stevia- I still love you!). I found it works best in foods as a sweetener, and not liquids. I added a packet to oatmeal, and it really pumped up the flavor. I also sprinkled it on banana slices (which wasn’t “ripe” enough, or sweet enough, for my liking), and it added a nice, mellow sweetness. Nothing too overpowering- but just right. Which is why the flavor was a bit lost when I added it to my tea- it was too mellow and dissolved quickly- so I will stick to sweetning foods with these packets. Overall, I like these packets. 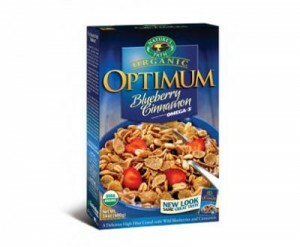 I give them 4 stars, because it really is a healthier alternative to table sugar, and has the added benefit of probiotics, fiber, and added nutrients. Good job, NXT Nutritionals! Want to try this for yourself? Go to the website & order a box, and I got a special code for ya to get $1.00 off a box until April 30th 2010! Just enter the code SUSTAXO and get &1.00 off! sweet 8) ! Inulin, Fructose, Natural Flavors, Probiotic (Bacillus Coagulans), Vitamin C (ascorbic acid), Cinnamon Extract, Goji Berry Extract, Bitter Melon Extract, Grape Seed Extract, Vitamin B6, Niacinamide, Biotic, Folic Acid, Chromium, Selenium, Vitamin B12.